MacGregor, part of Cargotec, has successfully completed container stowage system upgrades on board the first three of six Hapag-Lloyd 8,000 TEU container vessels during a scheduled drydocking. 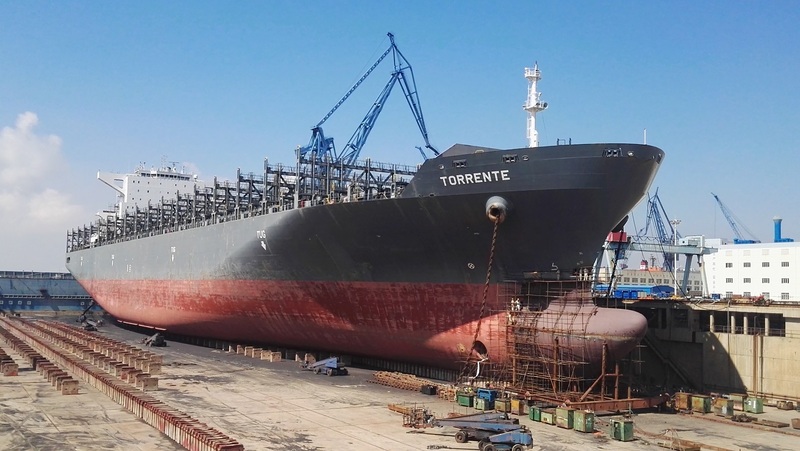 The work was carried out under a MacGregor Cargo Boost service, which is designed to improve cargo carrying efficiency and the earning potential of existing container vessels. "Every MacGregor Cargo Boost upgrade is unique to each vessel and route," says Janne Suominen, Cargo System Development Manager at MacGregor. "However, all are designed to maximise a vessel's ability to deliver a better return on investment for the owner. These particular upgrades were designed to deliver greater cargo system flexibility and allow for higher stack weights for 40ft containers; a sector identified as holding some revenue potential." The contract for the upgrades was signed in April 2016. Prior to this, MacGregor worked closely with Hapag-Lloyd to find the optimum solution for the vessels. "The docking schedule was challenging, but we were able to meet a timescale that worked for everyone," continues Mr Suominen. "This was achieved by good communication pathways between all parties and through qualified personnel carrying out the required work on time." "Although this is the first upgrade project that MacGregor has carried out for Hapag-Lloyd, our long-term relationship with MacGregor as a trusted partner for our newbuilding projects was decisive factor when placing this order," says Lutz-Michael Dyck, Director Ship Inspection / Technical Services at Hapag-Lloyd. "As the first ships re-entered service MacGregor also supported each vessel's crew through its 'smooth introduction' programme. This ensures that the upgraded cargo systems are used correctly and efficiently," adds Tommi Keskilohko, Director of Customer Solutions at MacGregor. Each vessel's MacGregor Cargo Boost upgrade includes lashing arrangement modifications and updates to their container securing manuals. MacGregor will complete its work on board the final three vessels in the latter part of 2016 and in 2017.